Gortakeeran, Athenry, Co. Galway. – Lynch Auctioneers, Galway. Lynch Auctioneers are delighted to bring to the market this superb five bedroom detached family home, measuring approximately 260 sq. metres (2,800 sq. 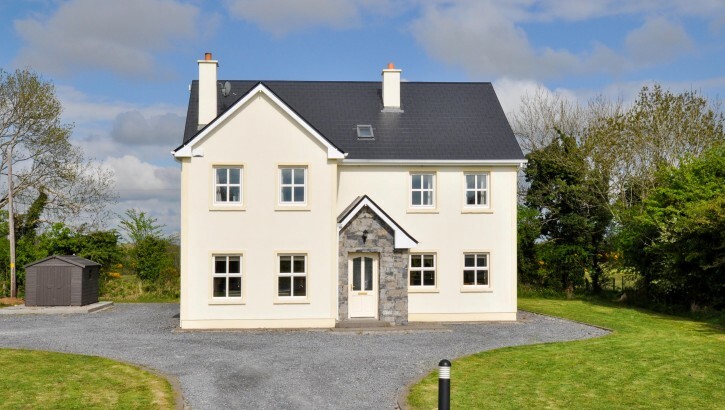 feet), situated on an attractive ½ acre site and located just one mile from the Motorway and a thirty minute drive to Galway City. This property is a real gem of a home with spacious living accommodation extending over three floors. 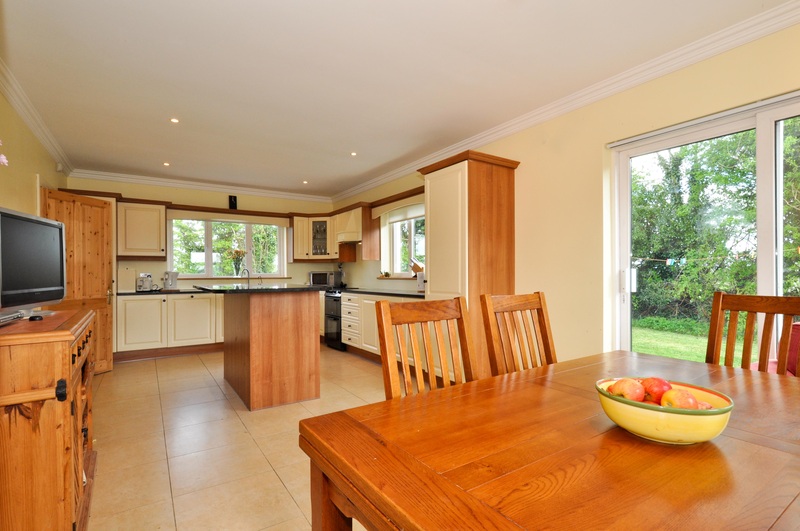 The kitchen/diner runs the full length of the house and has the advantage of a facility to add a stove. 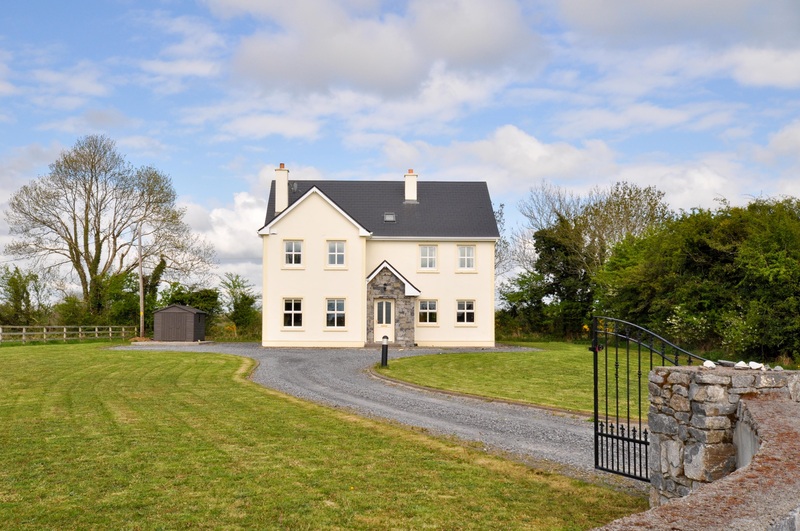 With a welcoming entrance, this attractive family home features a vast amount of beautifully presented accommodation. On entering this home, you are greeted with a spacious hallway with tiled flooring and stairway to first floor. 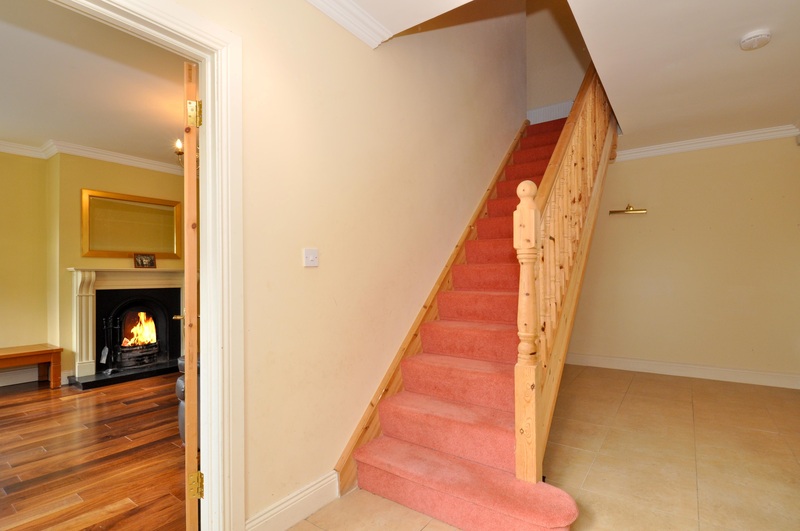 To the left of the hallway is the spacious reception room with wooden floors and feature fireplace with open fire. 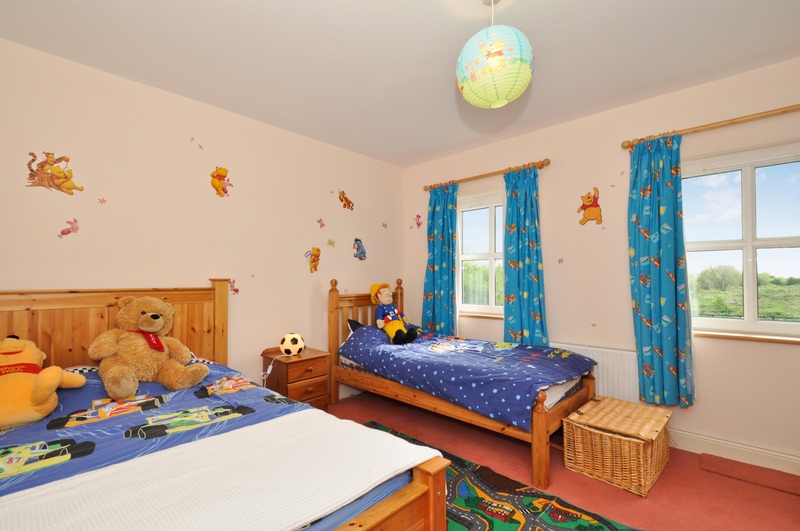 To the rear of this room is a second reception room, with shower room just off and could lend itself to a variety of uses such as playroom, downstairs bedroom or extra living room. The Kitchen/Dining room is the heart of the home and is situated to the right of the hallway and runs the full length of the house. 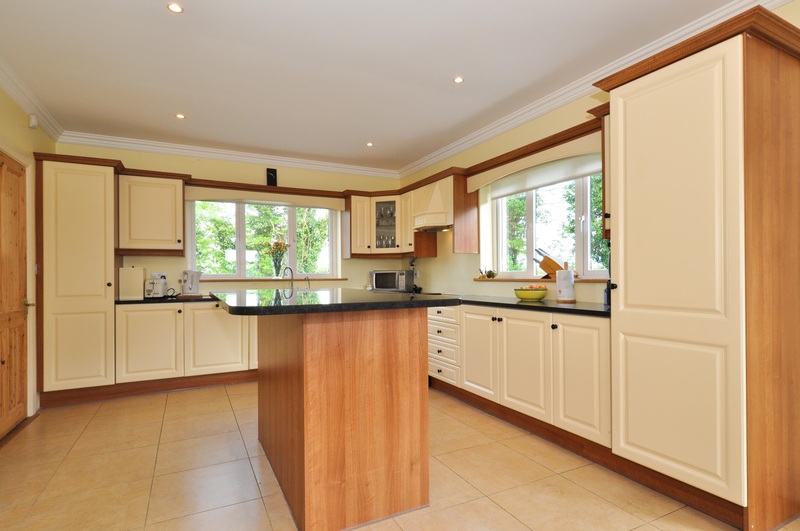 The Kitchen itself contains a variety of fitted cream units, granite worktop, an island centrepiece, tiled flooring, facility for a stove and there is a large dining area to the front, which has sliding doors to the exterior. Just off the kitchen, is the utility room; also with tiled flooring and matching built in units for additional storage and is also plumbed for washing machine and dryer. And finally at ground floor level, is a guest w.c. & w.h.b. 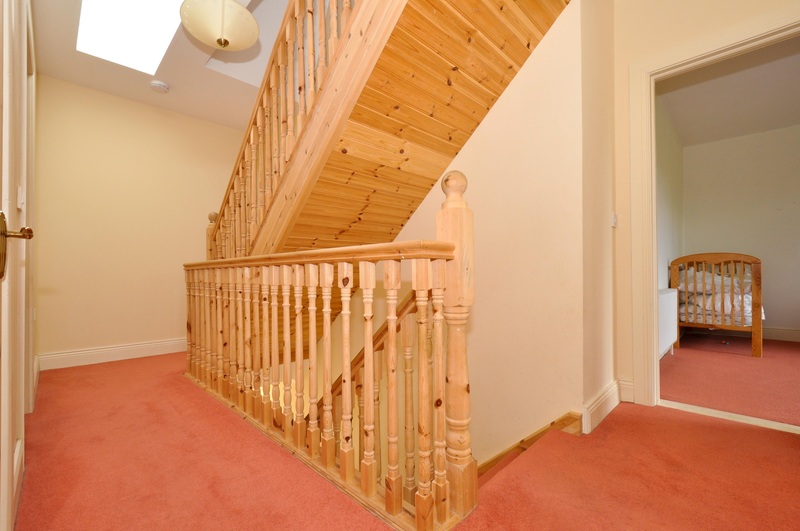 A wooden staircase, with carpet flooring, leads you to the first floor, where there are four good size double bedrooms, two of which are ensuite and the master bedroom boasts a walk in wardrobe. 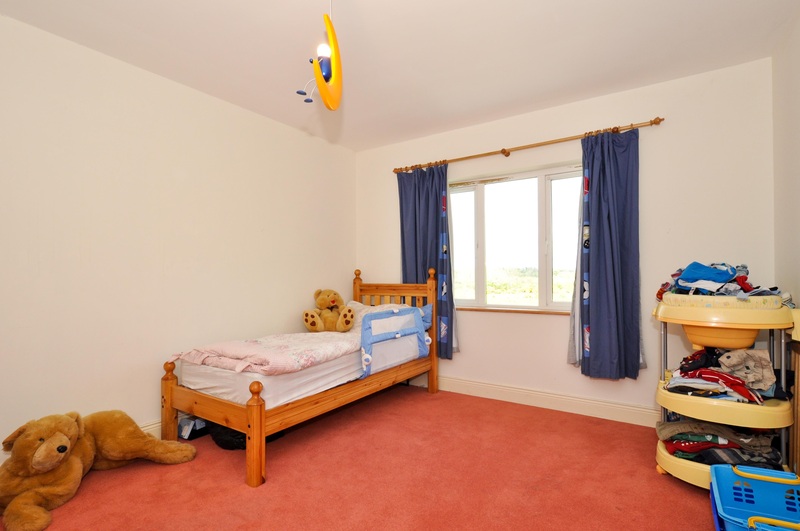 On to the third floor, there are two additional rooms, which would be suitable for office/study/playroom/bedroom. 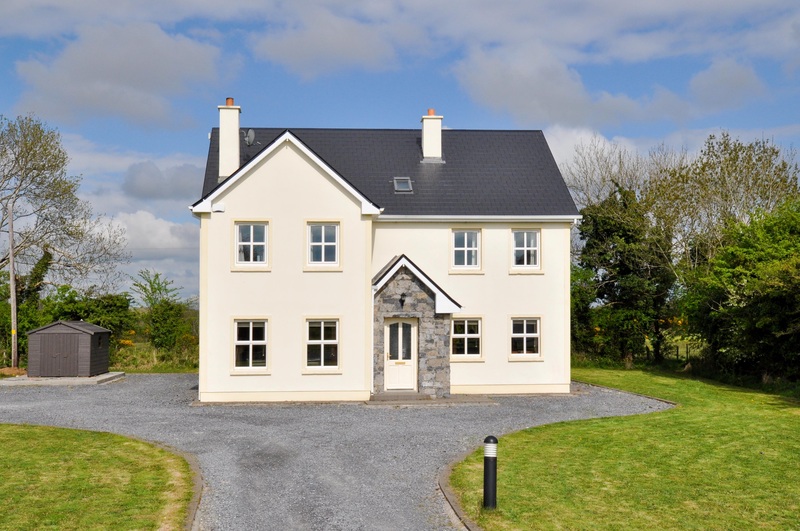 This property offers all the requirements of a busy family home which can only be appreciated on viewing. 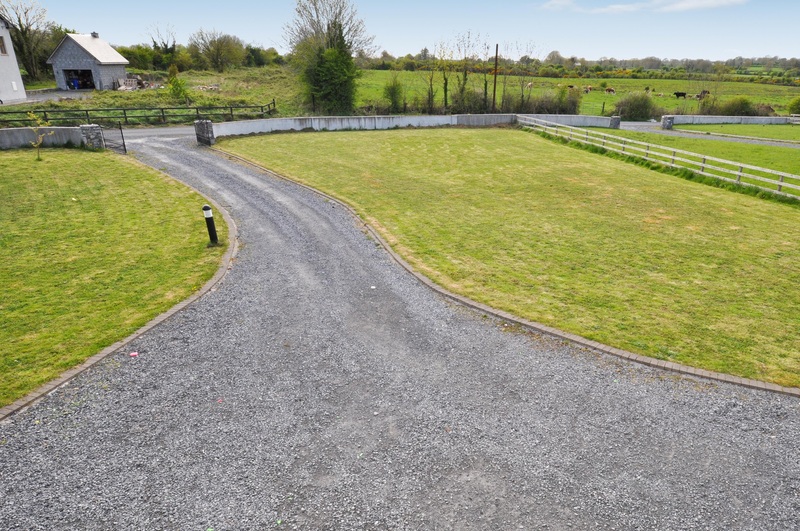 This lovely family home is situated on a beautiful sunny 0.5 acre, well maintained site, surrounded by a boundary wall to the front, mature trees and fencing to the sides and rear. There are double iron gates at the entrance and mature lush green lawns surround the property. There is a detached timber shed which is situated on a concrete foundation; suitable for a detached garage. 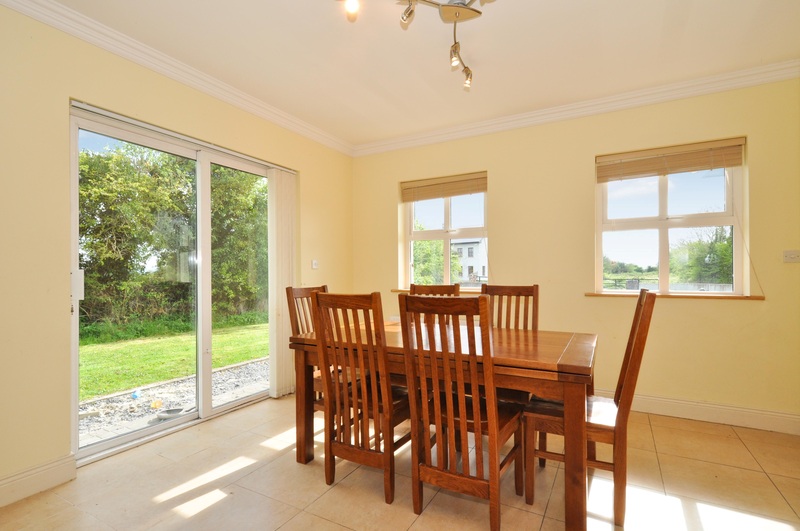 Kitchen/Dining room: 4 m x 8m (13’12 x 26’25); large Kitchen/Dining room with tiled flooring, variety of cream kitchen units, granite worktop, centre island unit, spacious dining area. 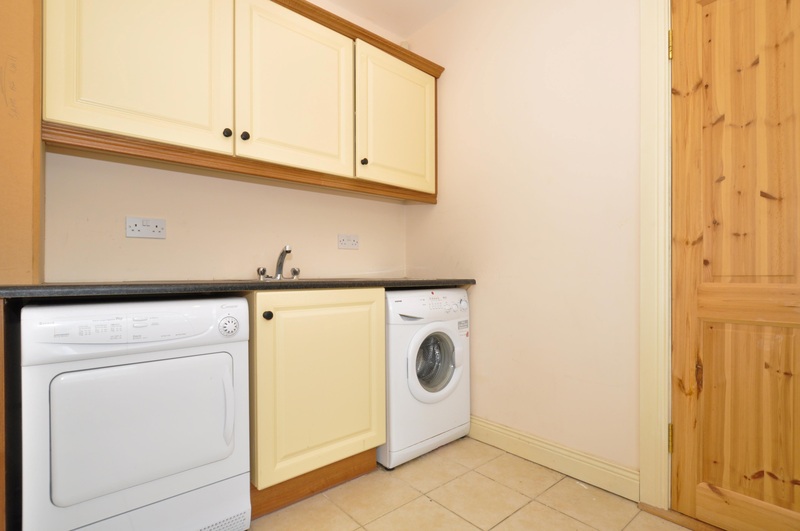 Utility room: 3.3m x 2m (10’8 x 5’6), situated just off the Kitchen and has variety of matching units for additional storage and is plumbed for washing machine and dryer. 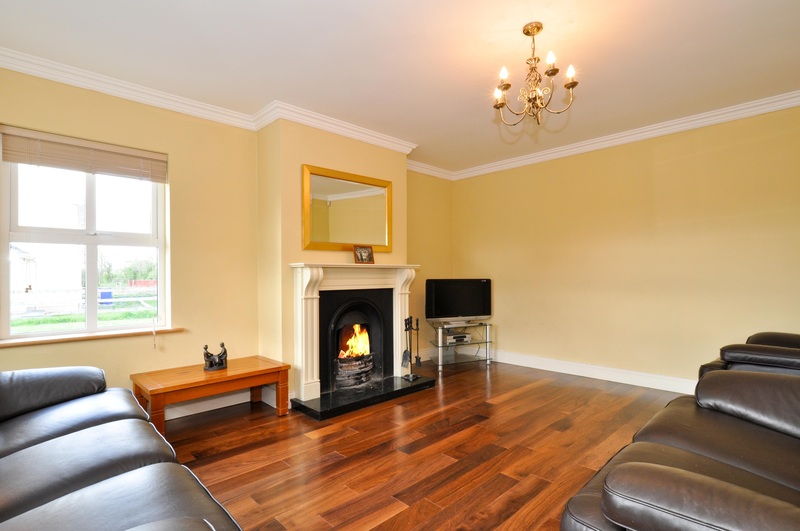 Sitting room: 5.2m x 4.1m (17’06 x 13’5), with solid wooden flooring and feature fireplace with open fire. Playroom/Living room: 4.4m x 3m (14’4 x 9’8), with solid wooden flooring and shower room. Bedroom: 4.3m x 5.6m (14’1 x 18’4), double bedroom with carpet flooring, walk in wardrobe and ensuite with white bathroom suite. Bedroom 2: 4.1m x 3m (13’5 x 9’8), double bedroom with carpet flooring. 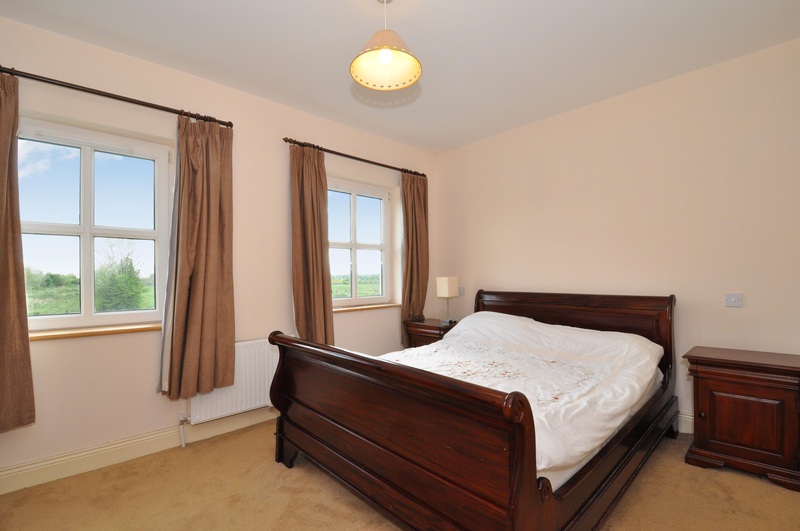 Bedroom 3: 4.2m x 4.1m (13’7 x 13’5), double bedroom with carpet flooring and ensuite with white bathroom suite. Bedroom 4: 4.2m x 3.8m (13’7 x 12’5), double bedroom with carpet flooring. 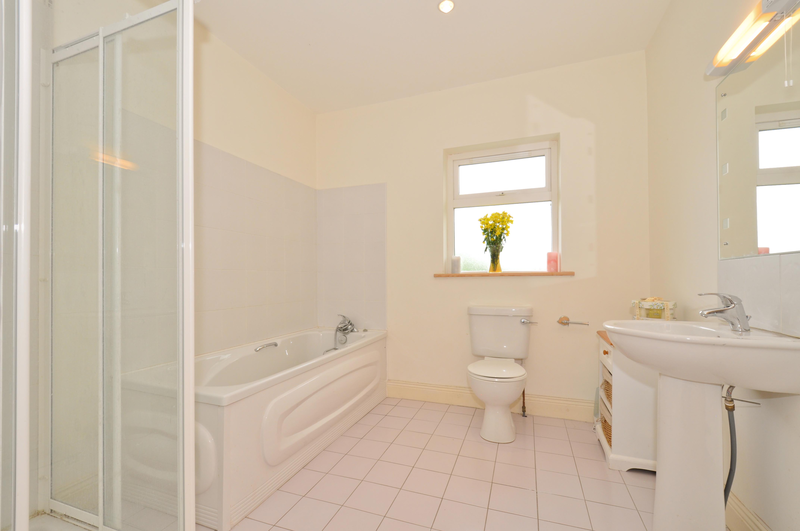 Main Bathroom: Partially tiled and white bathroom suite. Room 1: 4.5m x 3.7m (14’7 x 12’1), with carpet flooring and suitable for office/playroom. 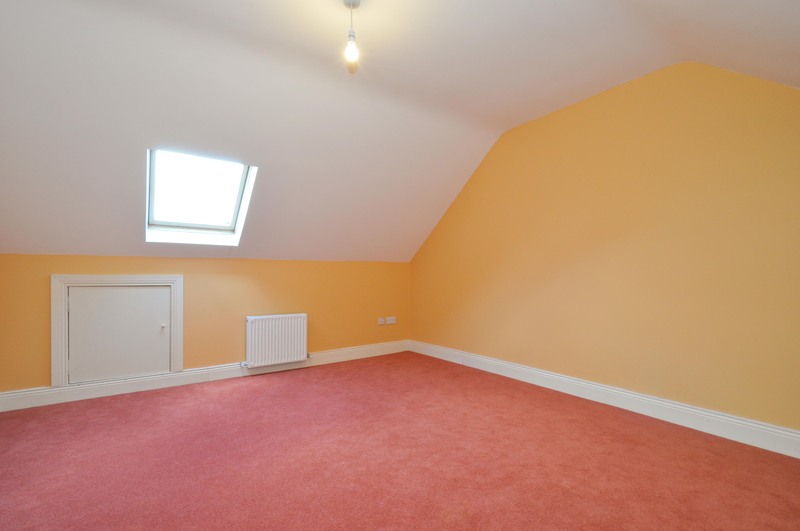 Room 2: 4.4m x 4.1m (14’4 x 13’5), with carpet flooring and suitable for office/playroom. Cable storage shed to side of property, situated on a foundation making it suitable for a detached garage. particulars do not constitute an offer or contract or any part thereof. ← 46 Laurel Park, Newcastle, Galway. © 2019 - Lynch Auctioneers, Galway.